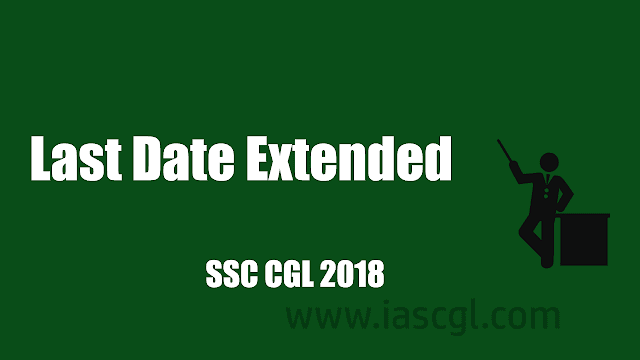 HomeSSCSSC CGLE 2018 | Last Date of Online application extend - Apply now if you missed it ! It has come to the notice of the Commission that some of the applicants have faced technical problems in filling the online application forms for CGLE 2018 since today morning (04.06.2018). Keeping in view this inconvenience caused to the applicants, t he Commission has, in the interest of the applicants, decided to extend the last date for filling of on­line application forms for CGLE, 2018 by one day i.e. till 5.00 PM on 5th June, 2018. As regard payment made through offline challan, it is informed that payments can be made at the designated Branches of SBI within the working hours of the Bank up to 07-06-2018 provided the challan is generated before 5 PM on 05.06.2018. The other terms and conditions of the Notice will remain unchanged.